This book is bloodydamn amazing, for starters. It's set in a dystopian society, which seems like it'll be the typical "protagonist introduced, protagonist gets loved one taken away, protagonist rises up and fights" type storyline, but it is inherently different and vastly intelligent. The reader gets a sense of a brutal honesty in the mind of Darrow. His character does not mask his feelings for his wife or his desire to get ahead at the Institute or anything, really. That particular take on a first person narrative is refreshing. There were many twists that I liked, ones that the reader may believe to go one way (because it would seem to be the obvious way), but then would completely surprise them. This book may pull on some dystopian themes to start, but it goes in a completely different direction. I'm also a sucker for anything using Roman and/or Greek mythology, so naturally this book was a win for me. 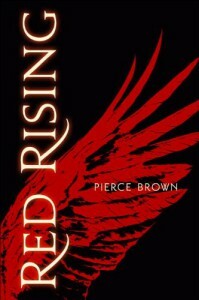 Pierce Brown definitely has a bright future ahead with Darrow and with this series, and I can't wait to read Golden Son.